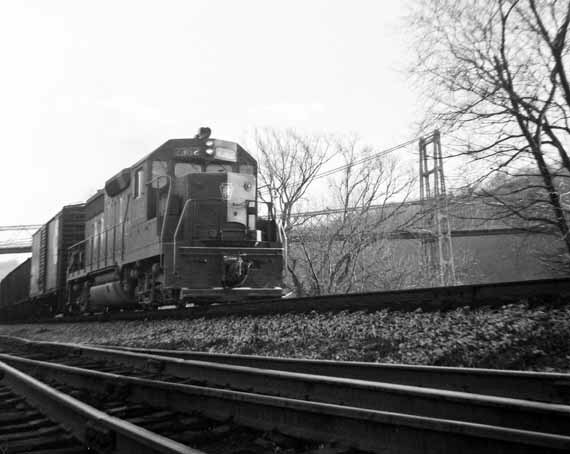 Eastbound freight at East Liverpool, Ohio, probably along River Road, April (7, 13, or 14) 1965. Picture and comments courtesy of Jeff Pletcher. 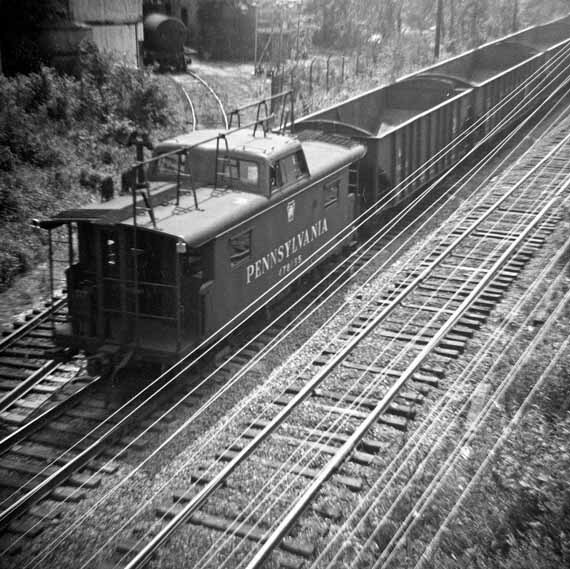 Westbound Pennsylvania Railroad freight on the mainline, East Liverpool, Ohio. I think this is a little west of the Broadway crossing, Chester Bridge in background. Probably April 26, 1965. Picture and comments courtesy of Jeff Pletcher. Wellsville-East Liverpool local eastbound on the mainline at East Liverpool. This location is probably a little west of the Broadway crossing, based on the building in left background which I think is Milliron Co. Near same location as photo "ELO 1965 April 9b" facing the opposite direction. April 26, 1965. Picture and comments courtesy of Jeff Pletcher. 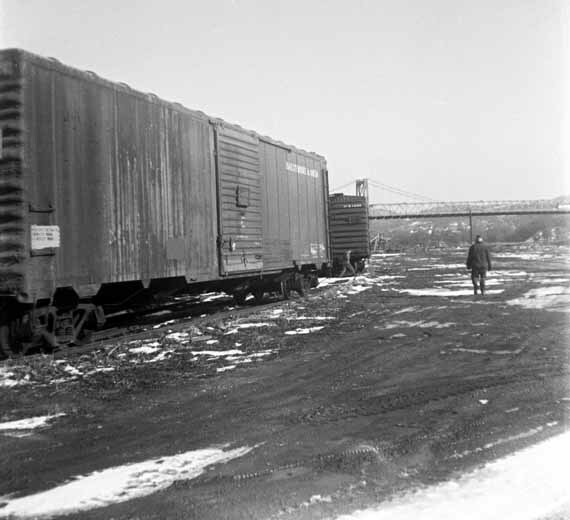 Eastbound freight on the mainline at East Liverpool, Ohio, at the small freight yard located behind Patterson Field, Newell Bridge just visible in background. April 26 or May 3, 1965. Picture and comments courtesy of Jeff Pletcher. 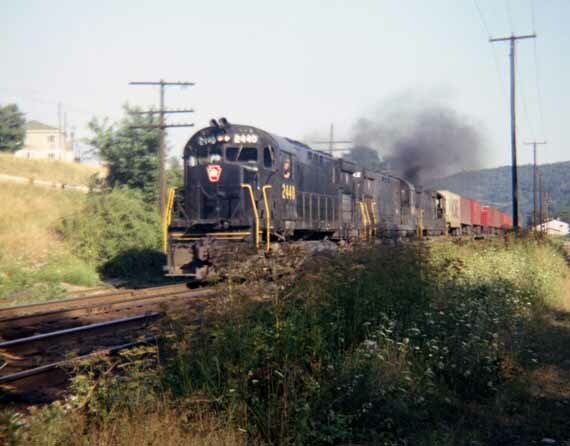 Westbound freight on the mainline at East Liverpool, Ohio, passing the small yard located behind Patterson Field, Newell Bridge in right background, City Hospital and sewage plant in left background. April 26 or May 3, 1965. Picture and comments courtesy of Jeff Pletcher. 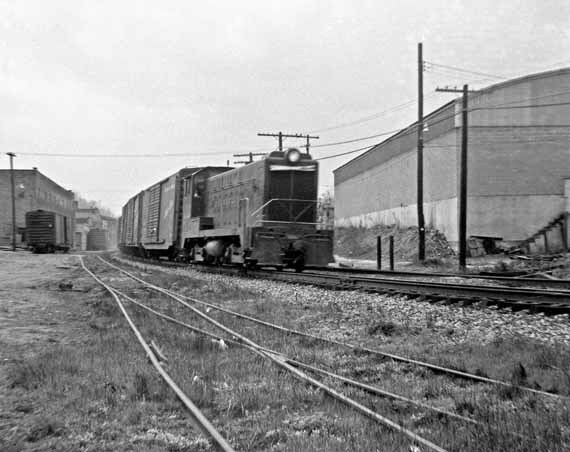 Pennsylvania RR local WE-101/102 switches the small freight yard behind Patterson Field, East Liverpool, Ohio, May 3, 1965. Newell Bridge in right background, City Hospital and sewage plant in left background. Picture and comments courtesy of Jeff Pletcher. Westbound PRR freight seen from Elizabeth St. overpass in East End, spring/summer 1965. Train is running "left-hand main" (normal operation is on the right-hand track) due to maintenance work on the westbound track, visible in the photo. This is the first in a sequence of three photos. Picture and comments courtesy of Jeff Pletcher. 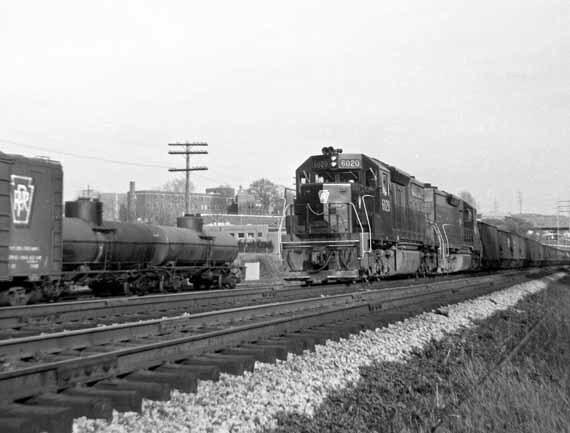 Westbound PRR freight seen from Elizabeth St. overpass in East End, spring/summer 1965. Train is running "left-hand main" (normal operation is on the right-hand track). This is the second in a sequence of three photos. Picture and comments courtesy of Jeff Pletcher. Westbound PRR freight seen from Elizabeth St. overpass in East End, spring/summer 1965. Train is running "left-hand main" (normal operation is on the right-hand track). Dakar Chemical Company is at upper left. This is the third in a sequence of three photos. Picture and comments courtesy of Jeff Pletcher. 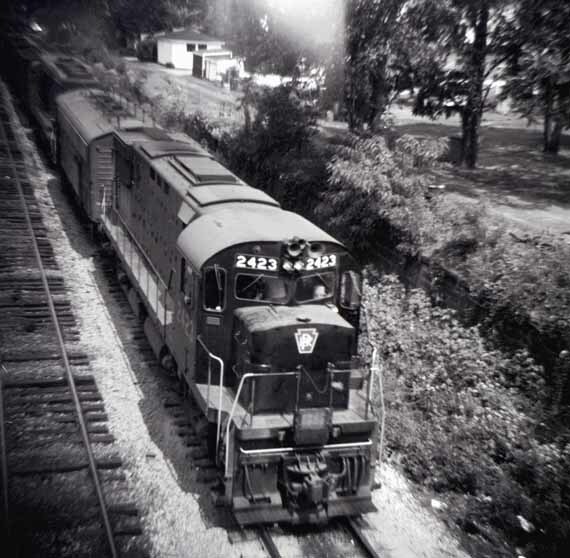 Eastbound Pennsylvania RR freight train on the mainline at East Liverpool, Ohio, July 26, 1965. Location is in front of A. W. Crawford building; I believe the street crossing the tracks in the background is either Washington or Market St. Picture and comments courtesy of Jeff Pletcher. 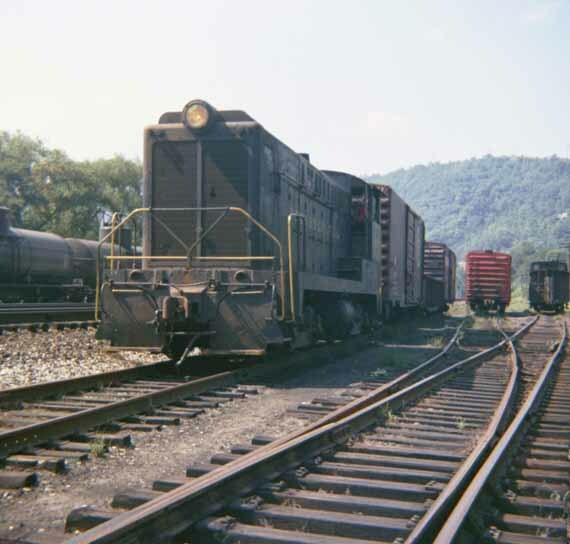 Westbound PRR freight at the small freight yard behind Patterson Field, East Liverpool, running "left-hand main" due to maintenance on the westbound main track. [The late] Roger Cooper, ELHS class of 1965, in photo. July 26, 1965. Picture and comments courtesy of Jeff Pletcher. "Going-away" shot of westbound PRR freight behind Patterson Field, East Liverpool, running on left-hand main track due to maintenance work -- note the work equipment on the westbound track. July 26, 1965. S.R. 7 visible on hillside above the train. Second in a sequence of 2 photos. Picture and comments courtesy of Jeff Pletcher. Westbound Pennsylvania RR freight running "left-hand main" at East Liverpool, OH, July 27, 1965. 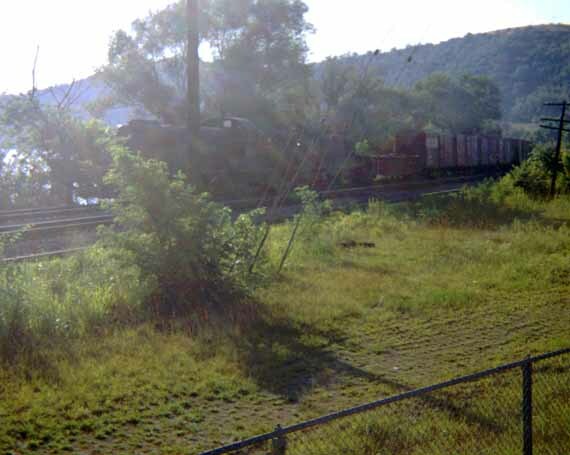 Location is the small freight yard behind Patterson Field, Newell Bridge is in the background. Picture and comments courtesy of Jeff Pletcher. 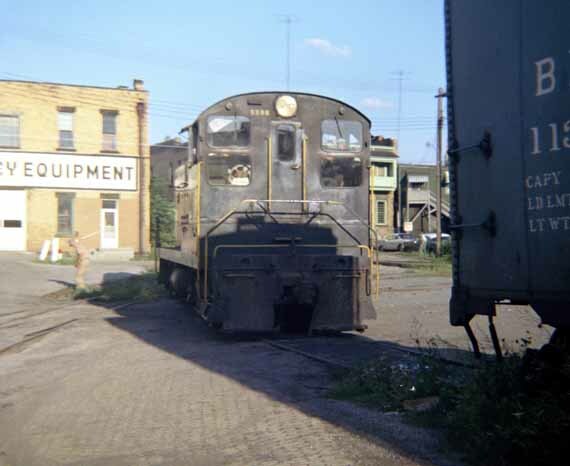 PRR switch engine works in the small freight yard next to the main line behind Patterson Field, East Liverpool, Sept. 10, 1965. Camera is pointing west towards Wellsville. Picture and comments courtesy of Jeff Pletcher. A book was published a few years ago titled something like "Pennsylvania RR -- Lines West of Pittsburgh and Northeast Ohio." (The authors are Oroszi and Hipes, something like that, if you want to look it up.) It is mostly photos but also gives a brief history of operation of the various lines. They say that the line through ELO was called the Bayard Branch. The main lines went to the north and south, toward Chicago and Columbus/St. Louis . . . "Our" line was used, I think, mostly for conventional "drag" freights, whereas the "hot" trains and passengers used the mainlines. 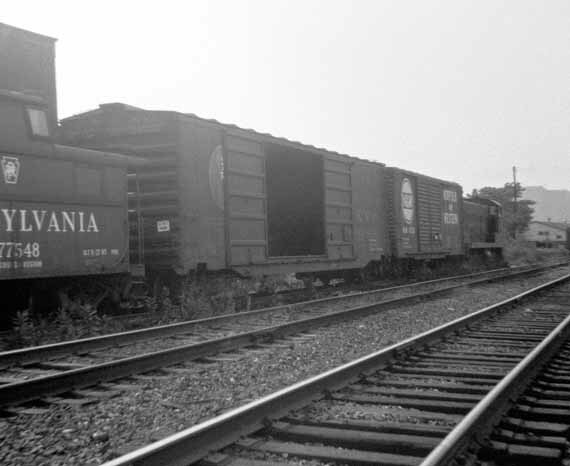 Our line was a low-grade route suited for heavy trains that did not have time-sensitive freight like piggyback (trailers) and merchandise. 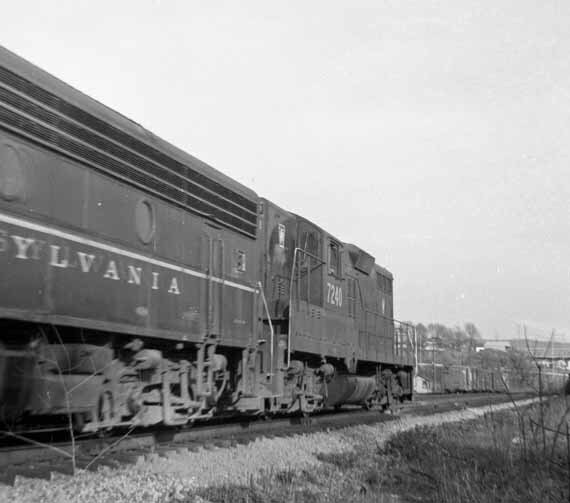 The Chicago line had some stiff grades coming up out of the Beaver River valley, culminating at Highland Cut near New Galilee. 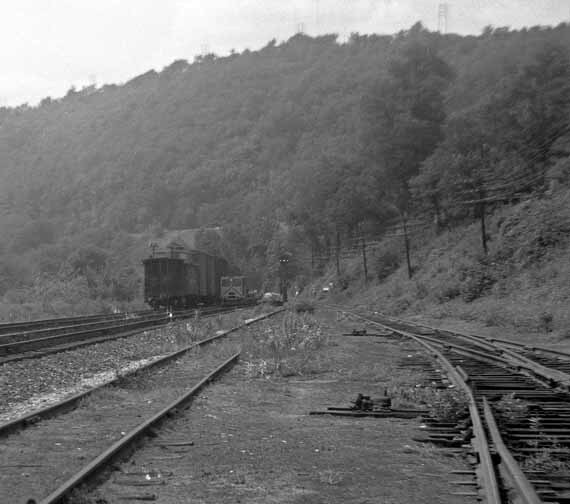 The Pitts.-Steubenville mainline had some grades, I think, east of Weirton. Comments courtesy of Jeff Pletcher. 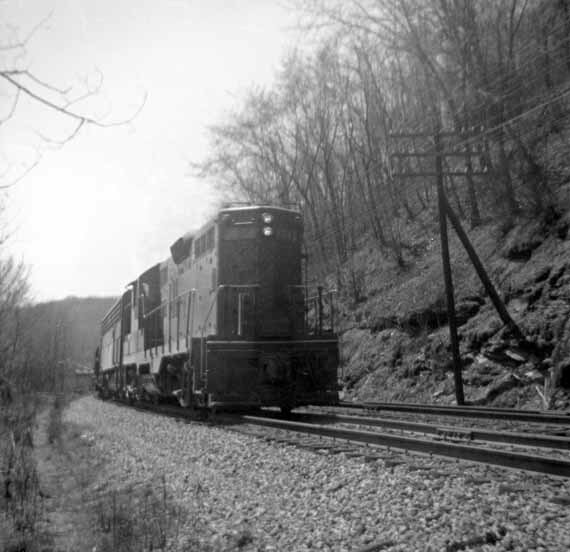 The ELO line was also used as a detour route when track work or derailments restricted use of the mainlines, because trains could access the mainlines near Canton or Mingo Jct. coming west out of Conway. I saved newspaper articles from the Review, mostly about derailments, but one reports that the Wellsville fire dept. was called out to "water" a detouring passenger train in the 60's. I wonder if anyone ever got a photo of one of these detouring passenger trains at ELO or anywhere else along the tracks -- famous trains like the Broadway Limited and Spirit of St. Louis? Rather unlikely since most of them came through in the middle of the night, but some secondary pass. trains did run during daylight. Comments courtesy of Jeff Pletcher. I remember as a kid seeing westbound freights consisting mostly (or all) of refrigerator cars, empty because the ice hatches on the roof were opened for ventilation. They would certainly be returning to Calif., South Texas, or Arizona. So there was at least some long-diatance freight that passed through our town. Comments courtesy of Jeff Pletcher. 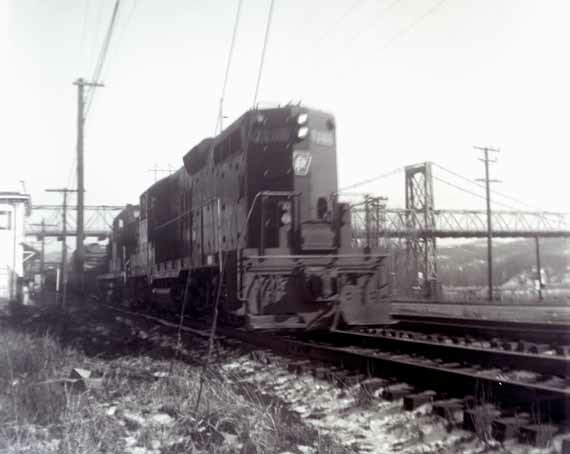 Westbound PRR freight on the mainline at East Liverpool, Ohio, at the small freight yard behind Patterson Field, Christmas Eve 1965. Newell Bridge in background. Picture and comments courtesy of Jeff Pletcher. 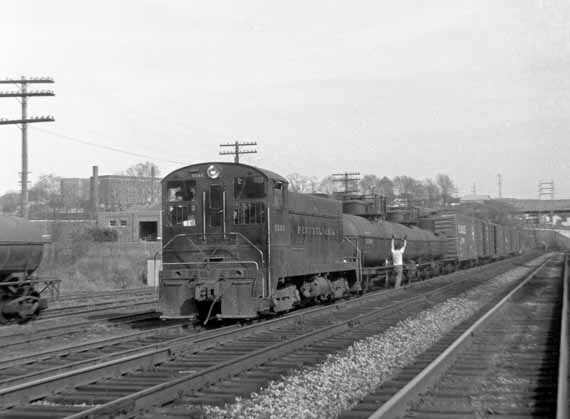 "ELO 1966 1" [below]shows a piggyback train. With reference to my email earlier today, the train in this photo may be detouring off one of the mainlines, in which case it could be bound for Chicago, Detroit, Columbus, Cincinnati, Indy., St. Louis. Picture and comments courtesy of Jeff Pletcher. Westbound PRR piggyback train beneath the shadow of the Newell Bridge, August 3, 1966. Picture and comments courtesy of Jeff Pletcher. 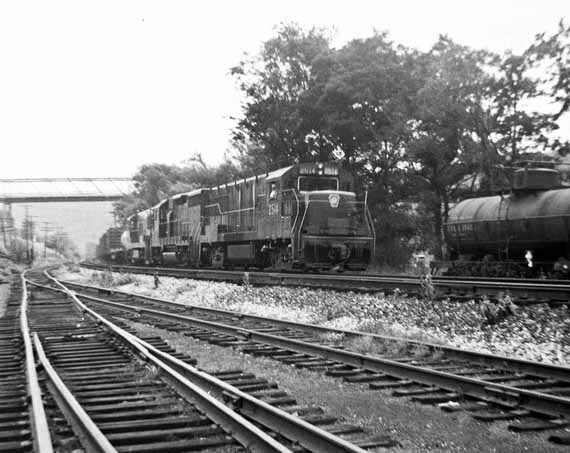 Eastbound PRR freight pulled by two Alco road switchers at East Liverpool, Ohio, August 12, 1966. Location is a little east of the small freight yard that was behind Patterson Field, and west of the Newell Bridge, camera is pointing toward S.R. 7 going to Wellsville. Picture and comments courtesy of Jeff Pletcher. 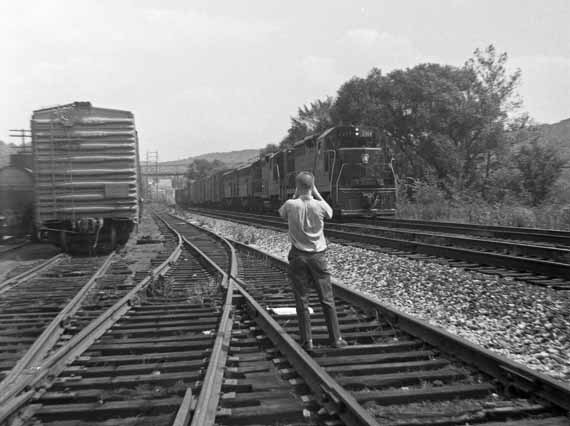 PRR local switches Dresden Ave. freight yard, East Liverpool, Ohio, August 12, 1966. Camera is pointing toward St. Clair Ave. Picture and comments courtesy of Jeff Pletcher. 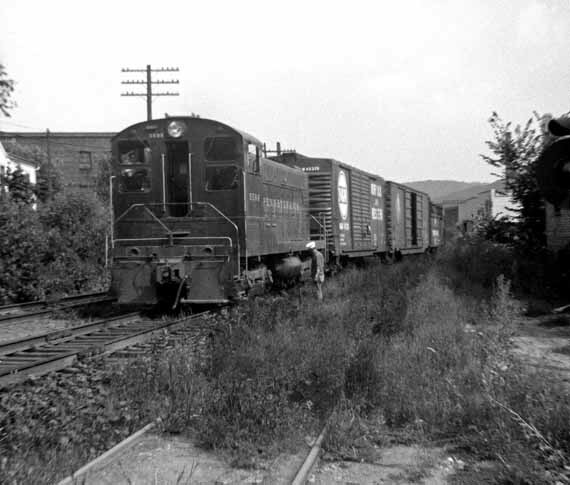 Pennsy Wellsville-East Liverpool local freight on the siding next to the mainline below Second Street at East Liverpool, Ohio, August 29, 1966. Picture and comments courtesy of Jeff Pletcher. 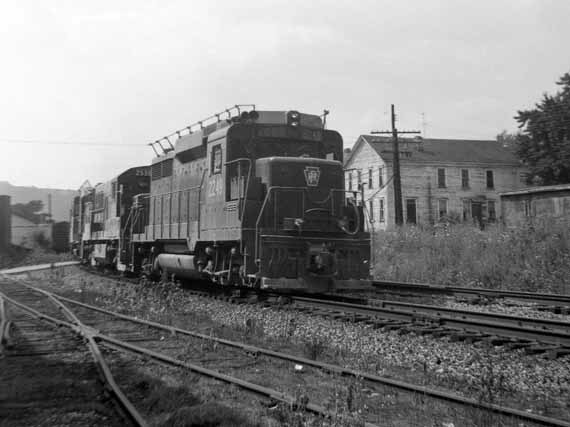 Pennsylvania RR Wellsville-East Liverpool local freight engine pulls onto the mainline at East Liverpool, Ohio, after switching the businesses below Second Street, August 29, 1966. (This may be in the vicinity of the Jackson Street crossing? )Picture and comments courtesy of Jeff Pletcher. 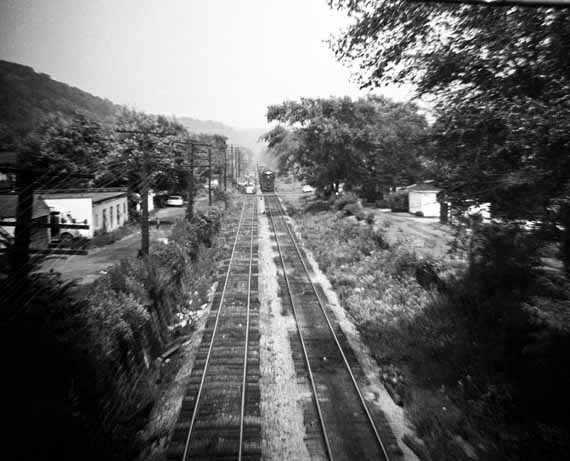 Westbound PRR freight on the mainline, East Liverpool, OH. This looks to be in the vicinity of the Broadway and Walnut Street crossings, Chester Bridge in background. Probably December 1966 or January 1967. Picture and comments courtesy of Jeff Pletcher. 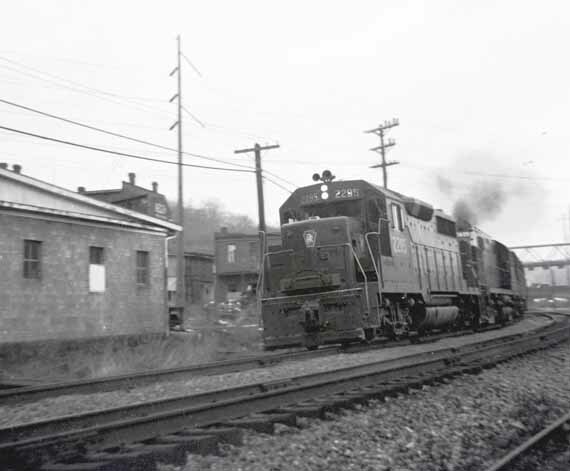 PRR local freight WE-101/102 spotting cars at the team track west of the Broadway crossing, East Liverpool, Ohio. Chester Bridge in background. Probably December 1966 or January 1967. Picture and comments courtesy of Jeff Pletcher.